Severe/Tornado Risk for Iowa March 22? The Storm Prediction Center has a high-end slight risk (30%) for much of Iowa tomorrow. They mention the possibility for supercells and isolated tornadoes. However, they also outline quite clearly their concern for dry air impeding both storm development and substantial instability to support supercells and/or tornadoes. While I admit i haven’t spent a great deal of time looking at this setup over the last couple days, I did look over the 12z March 21 WRF and GFS models. Both show an intense shortwave ejecting through the central plains tomorrow, bringing with it a surface low through eastern Nebraska/western Iowa, and strong southwest upper air winds. But the wave also brings with it quite veered 850mb winds. Throughout much of the day, very warm and dry air from western Canada will be advecting northeastward into eastern Nebraska and Iowa. This will not only scour out any deep moisture, but it will also bring a pronounced elevated mixed later to Iowa. In other words, there is going to be an enormous CAP to break in the afternoon! Luckily, the intensity of the vort max associated with the strong shortwave will cool the mid levels in the afternoon/evening and weaken the CAP. So it’s safe to assume at least isolated thunderstorms will fire along the dryline over eastern Nebraska/western Iowa very late in the afternoon/evening. But the next big problem will be moisture. With dry air advecting all day at 850mb, you have to assume some of that will mix down to the surface. So surface dewpoints will pay the toll. And the current forecast for dewpoints will probably be very generous, since they rarely handle mixing well in these situations. Finally, instability will be a problem since moisture is going to be an issue — especially closer to the dryline or the further west you go in the warm sector. I’m just not a big fan of this setup. But if I lived in Iowa and had nothing to do tomorrow, I might sit along the warm front in central or eastern Iowa. *IF* enough instability can indeed develop there (better 850mb moisture should be present) then I think the tornado potential would be pretty good. I also want to say that conditional setups sometimes produce nice tornadoes. I hope my post here isn’t completely discouraging to any chasers out there in the central plains. I’m just expressing my opinion as I see things at the moment. Good luck to anyone chasing tomorrow and be safe. I originally wrote the three paragraphs that are below the video on Friday night. But I had to wait for Youtube to approve the video after I uploaded it, which took well over an hour. Anyways, I fell asleep and woke up this afternoon without posting anything (it’s clear my body finally shut down to truly rest!). Anyways, below is the video I made from the March 8 chase. The video quality is rather low because 1)The contrast wasn’t that great, 2)it was raining the entire time, and 3)Youtube downgrades the video quality. The raw video is in HD and looks much better than this Youtube clip (unfortunately). It’s been a long week, and my body is still trying to recover from the beating it took from the traveling, storm chasing, and sleep deprivation. But I finally had the time and energy today to sit down and put together a two minute video of the storm chase. The video provides highlights from when we were just west of Paris, TX to the tornado just west of Clarksville, TX. 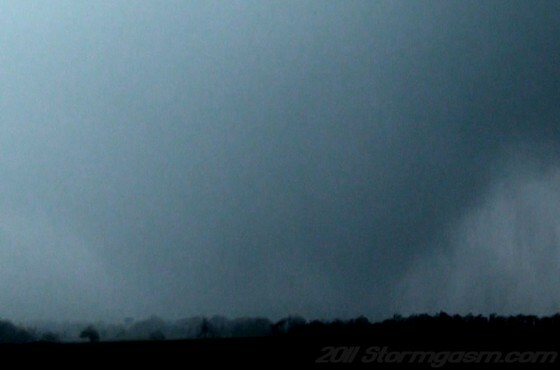 Please keep in mind the raw tornado footage is of a much higher quality (HD) than shown here. But, Youtube down-converts, so the quality just isn’t the same online. Also, the tornado was on the ground visually for a couple minutes before disappearing into the rain. This clip is only meant to show the highlights. I also want to stress one last time how incredibly difficult this particular storm chase actually was. We had to navigate on winding roads through blinding rains and wind for a very long time. This was both intense and stressful. Then when we were actually in position to physically see the tornado for a couple minutes, we were in a vulnerable spot relative to the tornado and intense core of the storm. Finally, as we exited our position and drove to the east on the state highway, we were forced to drive through more blinding rains, losing site of the tornado to our south. As a result, we barely avoided being hit by the tornado as it roped out and moved due north right after we regained visibility. The point here is chasing rain wrapped tornadoes is not easy, even for experienced chasers like us. It was risky, but we avoided a potentially dangerous situation by remaining very alert, and reacting to the situation at hand. This is an excellent example of why you should never try chasing on your own if you don’t have experience or extensive knowledge of supercell thunderstorms. 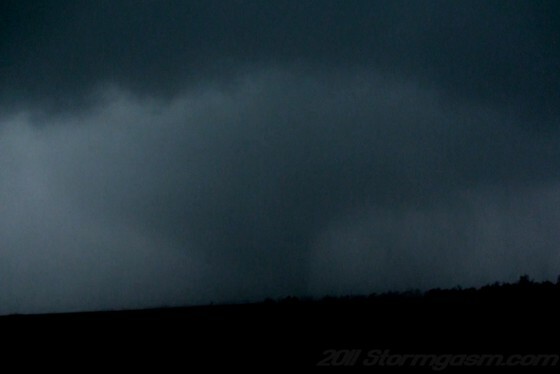 Tornado west of Clarksville, TX 3/8/11 at 5:07 p.m. CST. The past few days were completely exhausting, but worth all the pain since I got to witness my first tornado of the year with two old friends. The irony about the whole trip is I purchased the plane ticket to get me out there because I felt the cold core tornado setup looked great (and it did at the time). But the models were wrong, and by Tuesday morning, when Simon and I were looking at the new data to decide on our chase target, it had become quite clear that the warm sector was probably going to be our only hope of seeing a tornado. So not only was the original cold core setup essentially non existent by this time, but the setup across the overall Red River/Texas region did not look that good. It didn’t appear that the odds were in my favor that day for me to see a tornado, despite how things looked just 36 hours earlier. Anyways, we only managed a couple hours of sleep Monday night. Adrenaline and the fact that we needed to be up early to see the new data and decide how far we needed to drive kept us from getting any actual restful sleep. Shortly after Tom arrived, we headed South on I-35 with hope, but that’s about it. We ended up following storms east and south that afternoon across south central/southeast Oklahoma. But none of the storms were impressive, with short lived mesocyclones producing weak, mostly non-rotating wall clouds (see image below). Finally, we noticed a new storm in north central Texas that was separated moreso from all the other convection in the area. So we spent the next 1.5 hours navigating through small roads through southern Oklahoma, across the Red River, and into Texas to try intercepting that storm, which we were currently to the northwest of at the time. For that entire time we had no cell phone signal, so we had no data. But we knew we needed to continue on a general east direction as quickly as possible to have any chance of catching up to the storm, or whatever new storm may have developed, since we were behind the storm to the northwest. At this time the three of us (me, Simon, Tom) were depressed. We’d been in situations like this many times before, and it usually ends with not only no tornado, but no actual good supercell either. But we kept going because we knew the environment the storm we hoped was still alive would be moving into was conducive for tornadoes. Hope kept us moving east. As we approached Paris, TX we were finally getting close to the mesocyclone and core of the storm, which now had a tornado warning! But there was a traffic jam, and thus the storm was once again getting away from us. Luckily there was a state highway heading north shortly after we approached the traffic jam, so we took that, marking the beginning of a very stressful, difficult and fast pace race to navigate through the north and east side of Paris in an attempt to finally catch up to the storm. In this process we were only a few miles to the northwest of the mesocyclone. So the winds were roaring from the northeast at a very high speed, with blinding, wind driven horizontal rain pounding the car. I remember looking out the window to the south and seeing all the trees bending to the southwest, and it actually looked like everything was being sucked, like there was a vacuum off in the distance or something. The power of this storm was becoming quite obvious. You could even see the base of the clouds racing from left to right. The motions in the clouds were just amazing to see, as inflow just streamed into the center of the storm like something big was either about to happen, or was happening and the rain was blocking our view. We finally made it out of the core of the storm’s blinding rain and hail, and pulled over to the side of the road by an open field. This wasn’t a location we could stay in for too long though, because we were only a couple miles east of the core, and just a few miles to the north of the mesocyclone. But within a couple minutes, just as the rain started to come down again, an amazing clear slot developed to our southwest, but whatever wall cloud or rotation that was occurring was wrapped in rain and invisible. Then suddenly, several small lowerings in the cloud base became visible, and a tornado quickly developed. 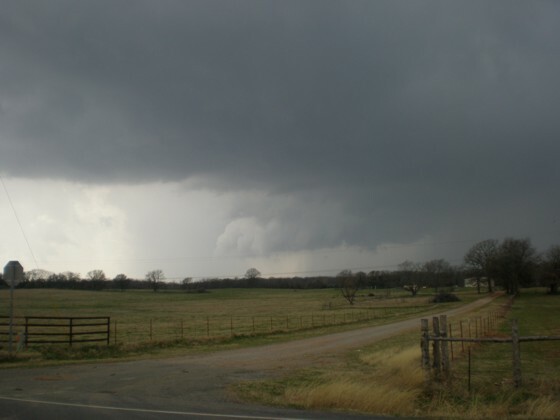 The tornado was first multi-vortex and then filled into a large wedge shape that had to have been at least 1/4 mile wide. It was moving rapidly to the east (right to left) and was partially rain wrapped the entire time, making it difficult to see. At one point one of the vorticies took on a stovepipe appearance, and then the entire tornado become wrapped in rain and invisible. 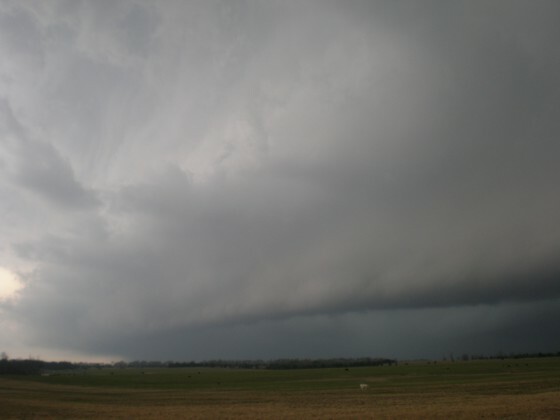 Striations above the gust front along the rear flank downdraft of the tornado-producing supercell 3/8 5:05 p.m.
Large clear slot visible on the left, with a rain wrapped wall cloud. This picture was taken one minute before the tornado became visible. Wedge shaped tornado to our south at 5:07 p.m. Being just north of the tornado and now seconds away from being slammed by the core (blinding hail and high winds), we then began driving quickly to the east again, and were soon greeted with blinding rains again as the wet rear flank downdraft punched through from the south. As we drove to the east, we were very careful because we could no longer see the tornado to our south, but never actually saw the tornado dissipate. Suddenly, we were out of the rain again. I looked to the side of the road to the south (right) and noticed a white rotating cloud almost directly above us moving quickly to the north, straight at us. Even though it didn’t looked like a funnel, it was rotating and you could see the rear flank downdraft feeding into the rotation. We quickly drove faster to avoid being hit by this possible tornado. After we were safely in front of it only seconds later I looked behind us and saw the white funnel moving due north on the right (north) side of the road. Now that it’s been a few days and we’ve talked to other chasers about the events that occurred, I learned that was indeed our tornado. It was in the rope-out stage and the RFD was occluding it to the north. Apparently vehicles behind us that did not speed up to avoid the funnel were hit and damaged. I did not see that and sure hope nobody was hurt. For us though, talk about a close call! We were literally seconds away from being hit by a tornado. But years of chasing experience and instinct allowed us to make a fast decision, bringing us to a safe location before it was too late. We chased the storm into southwest Arkansas but never saw it produce another tornado. We didn’t get back to Norman until midnight. That isn’t really all that late, but I had a plane to catch back to Connecticut that was scheduled to leave at 6 a.m. So we had three hours to eat, pack, load video onto our computers and provide some type of website and blog update before leaving for the Wichita airport. Needless to say I made my flight, but I got there as they were boarding the plane! I really don’t like cutting it that close, but at least I didn’t miss the flight. For what it’s worth my connecting flight into Chicago didn’t give me any time either. After exiting the plane into the O’hare airport, I spent quite a long time getting to my gate. I only had enough time to quickly use the restroom and purchase breakfast burritos from McDonald’s before the flight started boarding. Now remember I’d only slept a couple hours Monday night, and had been awake ever since. So the stomach acids inside me were angry, and greasy fast food wasn’t the best choice. But it was that or nothing. I finally made it home to Connecticut that afternoon. But I had an important dinner scheduled that evening, and had to run a couple very necessary errands too, before going to dinner. In the end I was up for around 40 hours straight after only getting a couple hours of sleep Monday night! But all the money spent, the fast-paced stressful travel, pain, sleep deprivation, stomach upsetting fast food and aggravation was all worth it to experience an amazing supercell thunderstorm and my first tornado of 2011! 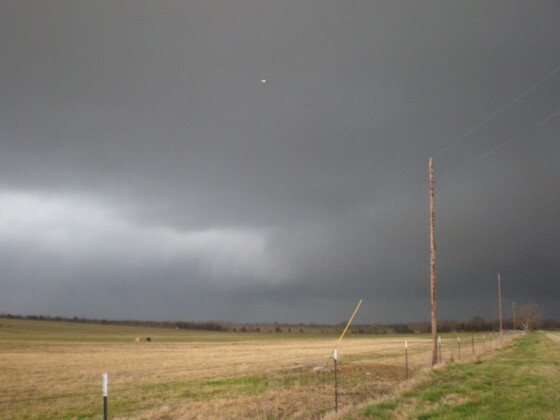 Jim Bishop heads to Oklahoma to storm chase on Tuesday (3/8). Tornadic supercells remain possible. The last twelve hours have been as much of a blur as an adrenaline high. It began with staying up very late looking at weather data, to purchasing a last minute flight to Wichita, KS. Then, getting stuck in traffic on the way to JFK due to an accident on the interstate. I arrived at my gate just in the nick of time to catch the flight, too, but only after running through a decent stretch of the terminal (the flight left early, too, so the running was most certainly warranted!). And now the adrenaline is wearing off a bit. But that doesn’t matter, because the prospect of tornadic supercells tomorrow will keep me going. And I’ll be there, hopefully in the right place at the right time. My friend and long time chasing partner Simon Brewer was kind enough to offer to pick me up at the airport tonight (Monday). Once we finally get to his place in Norman very late tonight, the updated computer models will be available. Hopefully, the data will be good news for us, but we’ll see. Every setup is risky with different things that can go wrong, and this one is no different. 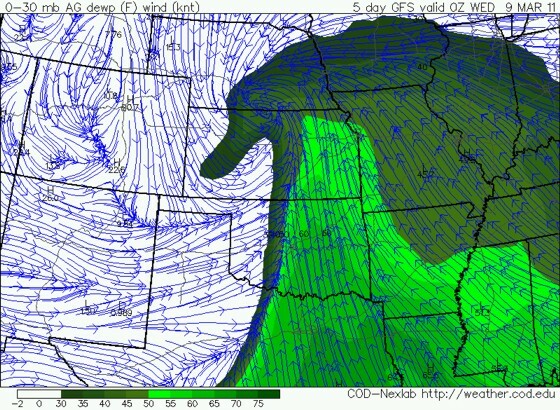 I decided to pull the trigger on this chasing trip for the cold core tornado setup. I’ve seen many of these produce amazing tornadoes over the years, but just never had the opportunity to chase a classic one before. I do believe this is one of those setups, which is why I’m heading out there. All the synoptic scale features seem to be in place, with some small, but key differences between the WRF and GFS models. Probably the most notable difference is the low level moisture. The GFS (at least at 12z this morning) was more enthusiastic with bringing deeper moisture into Oklahoma, while the WRF backed off a little bit from the 00z run. The only positive thing I can say about that is it’s normal for low level moisture to be a concern leading up to a cold core event. It’s the cold temperatures aloft that usually save the day. So I’m hoping moisture isn’t a problem even though the concern is in the back of my mind. Another concern that really goes for any cold core tornado setup is the relatively short window of opportunity you sometimes have for tornadoes. While these types of setups have a high probability of producing tornadoes, it’s usually within a 1-3 hour (or less) window of time. Not only that, but all the features have to line up precisely, or you don’t get the tornado-producing storms from some of the more classic events. Finally, I’d love to see the WRF and GFS agree on the exact location of the surface low. I’m getting a little picky here, but that is vital for tomorrow’s setup. With such intense dynamics in place, you really can’t expect two separate models to completely agree on this 36 to 48 hours in advance. But it would give me even more confidence in this setup if they come to agreement tonight (wishful thinking). Well, my fingers are crossed! Earlier this week, I mentioned the possibility for one or maybe even two severe storm/tornado setups across the Plains next week. Well now, a setup is beginning to materialize across the southern Plains for Tuesday, March 8 from southern Kansas into central/eastern Oklahoma and north/northeast Texas. The details are impossible to predict so many days in advance. But what we can do is look at what information is available and make some broad statements about what may be possible. The first thing I did was compare the GFS and European model outputs for the evening of March 8. While I’m not going to get into the European solution this time, it’s actually not necessary because it’s quite similar to the GFS solution. So that’s a good thing. Let’s begin with the GFS surface wind and pressure forecast (below) from 00z March 4 valid Tuesday evening at 6pm, March 8. We can see a surface low over central Kansas, and a corresponding cold front over western Kansas. Further to the south and east, a dryline has mixed east to the I-35 corridor across central Oklahoma/southern Kansas, draping south-southwest into parts of north and central Texas. This dryline from southern Kansas south into north central Texas will be our primary focus for thunderstorm initiation late in the afternoon into the early evening on Tuesday. Next, let’s take a look at the available moisture at the surface. For that, I’ve posted the surface dewpoints below. Notice upper 50s dewpoints are forecast to reach southern Kansas by 00z, but also notice lower 60s reach central/eastern Oklahoma. Further to the south in central Texas, mid 60s dewpoints are present. So based on the dewpoints alone, it seems there may be enough low level moisture to support severe storms on Tuesday anywhere from central Texas into as far north as southern Kansas. 00z March 4 GFS surface dewpoints valid 00z March 9. Next is the 850mb chart, and it’s very, very interesting. 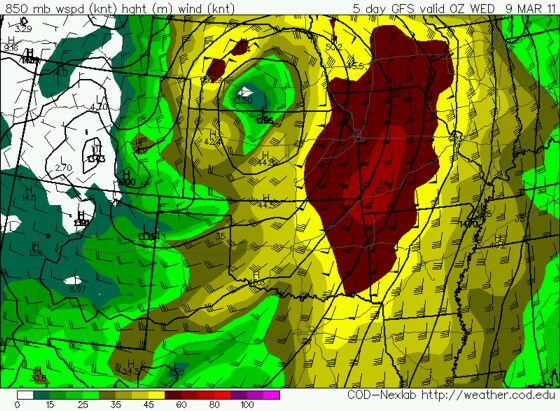 Notice the corridor of 45-55 knot south-southwesterly winds that covers all of eastern Kansas, Oklahoma and Texas. This alone presents a breeding ground for low-level mesocyclone formation and the possibility for tornadoes. Really anytime you have a abroad area along and ahead of a dryline — with decent available low level moisture –with 850mb winds out of the south or south-southwest at greater than 40 knots, it’s time to think tornado potential. 00z March 4 GFS 850mb valid 00z March 9. Next is the 500mb chart for the same time. Notice a 65-75 knot jet streak from the southwest is racing right over the dryline, the good low level moisture, and the strong 850mb jet. The combination of the degree of speed and directional wind shear with height (0-6 km) is ideal for fast moving supercells that will have the potential for producing tornadoes, if moisture is indeed adequate enough and the CAP isn’t too strong. While the following image is now shown, the GFS is forecasting 700-1000 j/kg of CAPE from the Oklahoma/Kansas border southward to north Texas. Given that, the available moisture, the lift from the dryline and the trough ejecting from the west, I’d say there’s certainly the potential for low-topped supercells Tuesday afternoon/evening. Given the strong 500mb winds, storms will be moving rapidly to the northeast. And with around 50 knots at 850mb, the tornado potential will be quite good with any storms that are able to completely break the cap. Finally, below the GFS forecast precipitation at 6pm Tuesday evening. Notice all the darker shaded (heavier) precipitation along and just ahead of the dryline in central Oklahoma up to southern Kansas. This is the model forecasting (IMO) supercells. 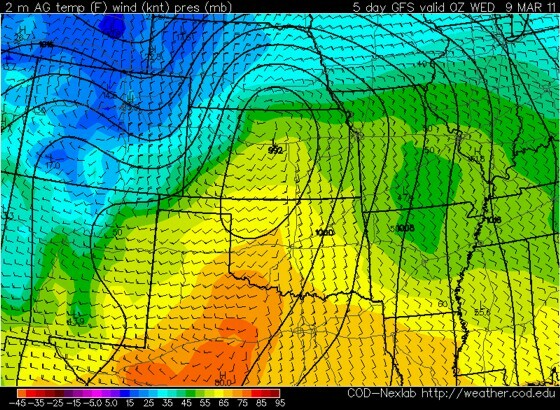 So it appears the model believes the CAP will break sufficiently along the dryline. But the model is also forecasting precipitation all across the warm sector (well east of the dryline). This probably means the 850mb jet is so strong, it produces light rain and some elevated convection throughout the day. This may present problems, but it’s too far out to really talk more about those details. 00z March 4 GFS precipitation forecast valid 00z March 9. Putting the details aside, Tuesday is a day to keep an eye on for low-topped supercells and potentially some tornadoes across the southern Plains. The other day I was curious if there were any more videos of the tornado and supercell from late February along the Oklahoma/Kansas border. The curiosity existed mostly because, at least in my experience, not that many people go chasing in February. What I found has been a little surprising, with about two dozen chaser reports from tornado photos and videos, to accounts of seeing the supercell in the distance. In some of the videos the roads were congested in way that was almost to the point of looking like a standard chase day in May than February. But this really shouldn’t be surprising to me anymore. Even though that day (Feb 27) was a slight risk with conditional probabilities for a tornado occurring due to a strong CAP, tons of chasers were out there. I guess I just felt like bringing up the topic before the chase season really kicks into gear in a few weeks. But for the time being I’m sure we’ll have a few more marginal setups that will yield hoards of chasers, many whom wouldn’t have been out there five years ago (much less ten years ago). And it’s not my intention to insult any chasers that were out there. If anything I say congrats to you for having the foresight to chase that day. What I am doing is commenting on the obvious here: Every year there are exponentially more and more chasers out there in the Plains, and the increase is becoming more obvious earlier and earlier in the season each year. It’s worth nothing that a growing number of these chasers stream live, and that benefits me when I can’t be out there chasing! So let me be the first to admit how nice it is to watch a tornado live on my computer from Connecticut. This also helps meteorologists at local NWS offices in validating chaser tornado reports. I mean seriously, if you see the live video of the tornado with the same storm that is a ‘radar indicated tornado’, I think it’s time to upgrade to ‘confirmed tornado’. Again though, a few years ago people would have laughed at going out chasing in February.